I salute you. 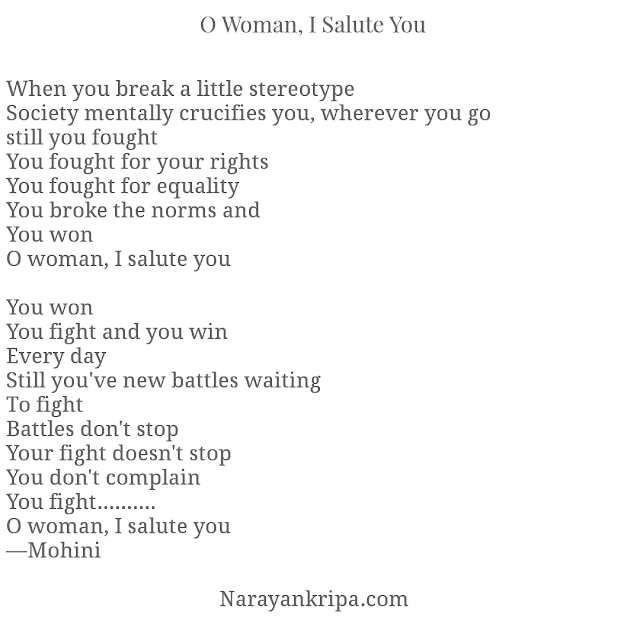 I salute you for being a woman. I wish you a very happy women's day. Let me ask you a question, before you perhaps think to celebrate women's day, what is a happy day for you? I know, being a woman, like you I know. You might not identify what is that that makes you happy. Your happiness, if you identify, must be related to others' expectations from you. The expectations which make 'them' happy and you're then described as happy. Or may be....the moments when your loved ones feel happy...that must be your happy moment. No! I am not trying to imprison your existence by encouraging you for more sacrifices. Can you recall when was the last time you truly lived, selfishly, for yourself? I said selfishly.... will that make you selfish? (Misogynistic comments are ringing in my head.) You weren't allowed to live for yourself. Whether or not your sacrifices are glorified you are forced to kill your own self. And that you should make your happiness. Isn't it true? I won't write too emotional. I don't want to contribute to converting women's day into one more marketing campaign. I don't want to market your incredible fight and sacrifices for selling my product. I just want to wish you a simple happy woman's day. Simple! Yes, a day free from stalking, unwanted touch, groping, and abuse. I want to wish you a day free from misogynistic remarks and jokes on your identity, your womanhood. I wish you a day free from hatred for demanding equal rights, feminism. I wish you one single day free from objectification. I wish you a simple happy woman's day. 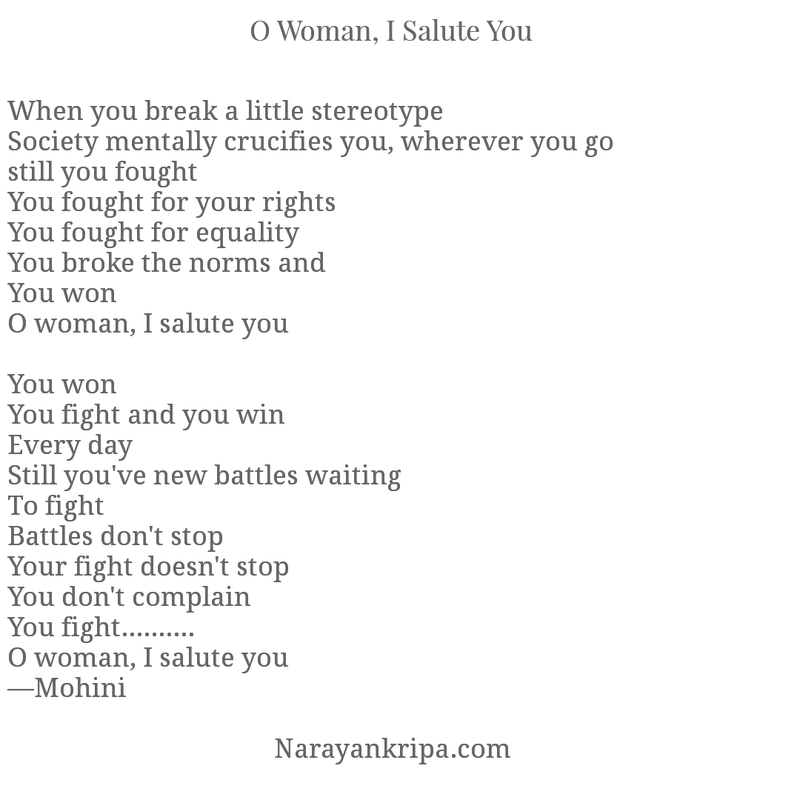 O woman, I salute you!